At first, we observe the club kids from a safe distance, venturing out to a daytime party at ://about blank, a place on the fringe of Friedrichshain that boasts a sprawling outdoor garden. Here, dirty couches and bean bag chairs are nestled under the trees and every surface is occupied by cuddle puddles of disheveled clubbers in their early 20s who look like they’ve been on the party train for the past 24 hours. They’re a blurry mess of smudged eyeliner and tangled hair enshrouded in clouds of cigarette smoke. The uniform of choice is black, white and adidas. The only colorful items on display are the fanny packs. The dancefloor is littered with beer cans and glitter and unabashed techno devotees. A lone girl in glasses and pajama pants breaks it down to the beat. It’s like she just woke up, went to pee but heard the music down the street and couldn’t help herself. She looks so damn arty and free. I am mesmerized, and I want in on this immediately. The following days are spent sifting through racks at Pick & Weight, a vintage store where clothing’s sold by the kilo. I fish out a denim jumpsuit that’d fit right in at a Soviet car factory and a pair of pink suede boots with square heels. Miraculously, this unlikely combination turns into an outfit, once styled with a new latex belt bag, long bangs and round sunglasses. I have no idea who I am anymore, but I like it. My collection of leather items triples. Pencil skirts and riding pants and a jacket with studs bring me closer to belonging than the ability to ask for directions in German ever could. There’s a huge disdain for brands here, so I tuck my once-prized sample sale Michael Kors handbag into my suitcase and sport a vintage leather backpack instead. I stop wearing heels. I reserve my girly floral dress for strictly at-home wear, having once gotten looks of pity from Dc. Martens-clad teens in Kreuzberg. I swap photogenic Aperol Spritzes for bitter pilsners. I don’t look back. Here, it is exceedingly easy to become somebody else, all you need is a costume closet. It is in an ensemble of leather pants, a black tee and pitch-black eyeliner that I make my first attempt at night life. The nights here don’t begin until dawn, but we naively leave the house at 11. The only two people inside a dilapidated building you’d easily mistake for a condemned squat house, are the DJ and the bar tender. Like two post-apocalyptic cyborgs, they do not acknowledge our presence. She is deep in the mix, head bopping up and down to the rhythmic sound waves emanating from the speakers. He is reading a novel on his kindle, not thrilled by the intrusion. We sip our pilsners in silence. About an hour in, Farbfernseher slowly stirs to life, with a few more patrons trickling through the doors. Everyone seems angry, like teenagers wading through their own discontents. But there’s something too specific about all the track shorts teamed with pulled-up sport socks and the artfully torn t-shirts. I suspect these aren’t looks that have been haphazardly thrown together but are actually a carefully cultivated edit of squatter-style cool. I think I recognize a certain pair of boots from a Pick & Weight zine and count three women in the room sporting the micro bangs. Three’s a trend. Is it still authentically cool to wear something if everyone’s doing it? 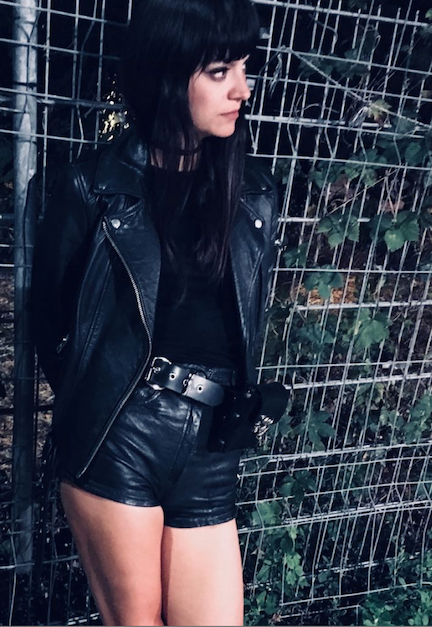 Am I an imposter, appropriating the city’s anti-style style with all my leather? Whatever. I’m still going to Berghain. Berghain, the techno temple that took up residence in the former Communist power plant over a decade ago is revered as the world’s best club. The draconian door policy is as famous as the venue itself. Sven Marquardt, the loyal doorman with an imposing face tattoo, has been passing judgment on the eager wannabees for as long as the club’s been in existence. It is such an institution; the government gives it a tax cut. Only other venues getting such preferential treatment are museums and concert halls. Everyone who comes to Berlin dreams of getting in, but not everyone’s destined to. For weeks, there’s nothing I want more. We arrive at the fenced-in lot in the East on one gloomy Saturday. The 100 or so people in front of us are standing in stark silence. The mood is akin to a Soviet bread line. Everyone waits grimly, uncertain if there will be anything left when they reach the front. Trying not to appear too interested I glance around tentatively. Our fellow hopefuls are a diverse bunch, but they seem to fall into distinct categories. The Normcore Loner. Solo man in his 30s, dressed unobtrusively in jeans, t-shirt and sneakers. This squad means business. They are serious music aficionados, so serious, they don’t even need friends. Don’t ever use “partying” and “Berghain” in the same sentence unless you want to out yourself as an ignoramus. The Arrogant Locals. They’ve been in before and have their strategy down to a tee. They dress fearlessly, with a little more flair: in hats, in capes in neon belts. They bank on their fluent German as a bargaining chip, knowing they will be able to decipher anything the doorman mumbles at them. One such couple arrives minutes before the doors open. They cruise up to the two Japanese guys in front of us puffing rings of smoke in their faces. It only takes a millisecond of hesitation. The Japanese take a half a step back, creating a momentary opening. Like parasites, the new arrivals barge in and assert themselves. Dumbfounded by the rudeness, the wronged tourists attempt to make things right. They point out that they’ve been waiting for an hour and desperately look around the line for witnesses. But everyone diverts their gaze and pretends not to have seen the incident at all. We’re too close to the doors to create a commotion. It’s every man for himself. The Unripe. This last group is everyone who isn’t worthy. They are too young, too eager, too scared, too English, too loud, too polished, too pretty or just too unlucky. Sven takes one look and nods his head the other way. The rejects step aside instantly, there’s no arguing with the face tattoo. Their heads hang low. They’ve been waiting for hours like the rest of us. Sometimes they don’t even know what they’ve done wrong. Now, publicly humiliated, they are forced to seek out Saturday night out crumbs elsewhere. We shuffle forward. I take my jacket off and tie it around my waist. Five seconds later I put it back on. I’m perspiring from tension, surprised by how seriously I’m taking the whole thing. I tell myself it doesn’t matter, but really, everything’s on the line. We’ve been living in Berlin for months. We’ve done all the things, but this we haven’t dared to attempt. The fear of being shoved aside rears its head the closer we step to the doorway. We leave Berlin and Europe in just two days. The past six months flash before my eyes. I’ve given up my New York life to travel the world, but if the new vagabond me is not welcomed here, I may as well have gone nowhere at all. Will I crawl back to my city defeated, or stroll in triumphant? It’s our turn. We step up to the German giant, like to an oracle at Delphi, ready for deliverance. Up close, I can see that his eyes are kind and his salt-and-pepper beard gives him an uncanny resemblance to a rock-n-roll Santa. Whatever is next, I’m ready. Thy kingdom come.